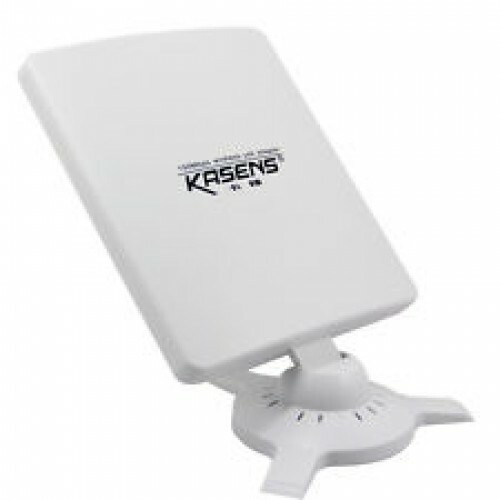 The Kasens KS-N5200 is a high-power 150Mbps WiFi USB adapter, which is equipped with 6600MW main unit and 80DBI omni-directional antenna to ensure stable WiFi signal, and supports WiFi 802.11 b/g/n with the data rate up to 150Mbps. With Anti-radiation design and easy to use, it is really a wonderful WiFi USB adapter for choice. - 100% brand new and high quality 6600MW 80DBI Antenna 150Mbps Wireless WiFi USB Adapter. - WiFi Standard: 802.11b, 802.11g, 802.11n. - Interface: USB 2.0 A-Type. - Power consumption: Transmission /Reception. - Antenna: 80DBI panel Antenna (SMA connector). - Driver support: Windows 7, Windows2000/XP/Vista , Linux, MAC.